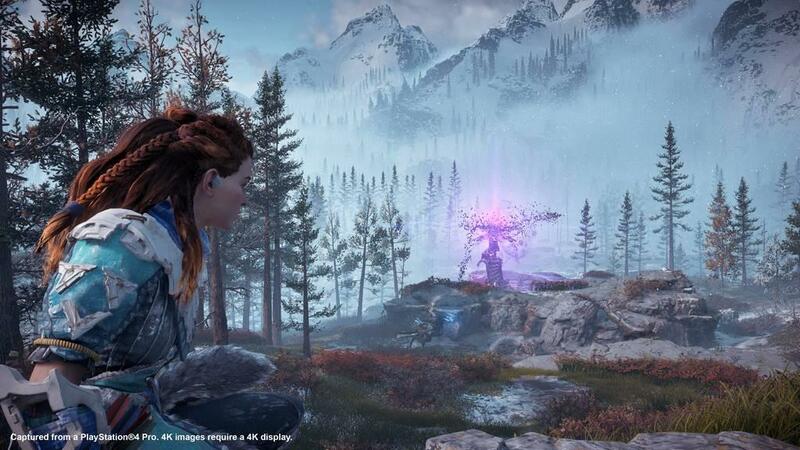 With how ridiculously good 2017 has been for gaming, you could probably forgive me for forgetting that another game of the year candidate, Horizon: Zero Dawn was released just a scant eight months ago. 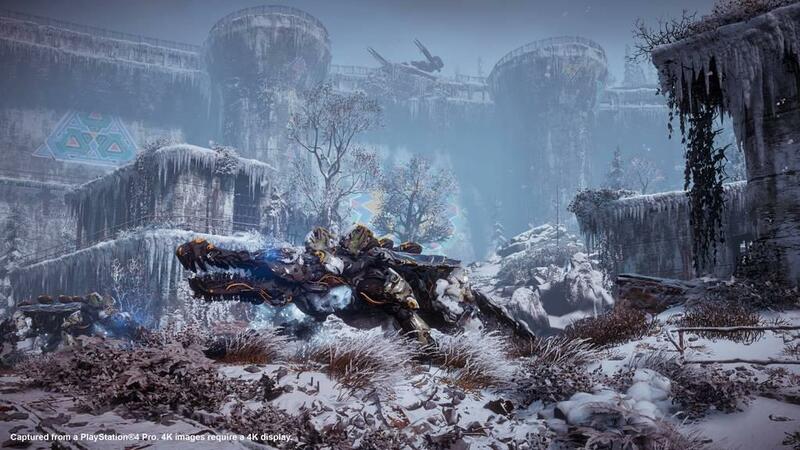 Well, Guerrilla Games didn’t want us to forget, so we’ve got an expansion pack, The Frozen Wilds, for lapsed gamers to explore. 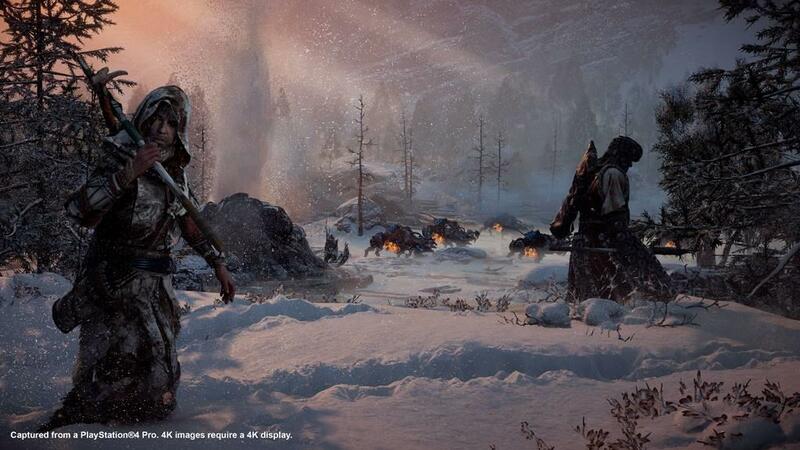 But is the expansion able to recapture the magic that I felt during my first go-round with Aloy? Are the Banuk a compelling enough subculture in the post-apocalyptic world to dedicate a whole expansion to? Well, actually it is, and they are. 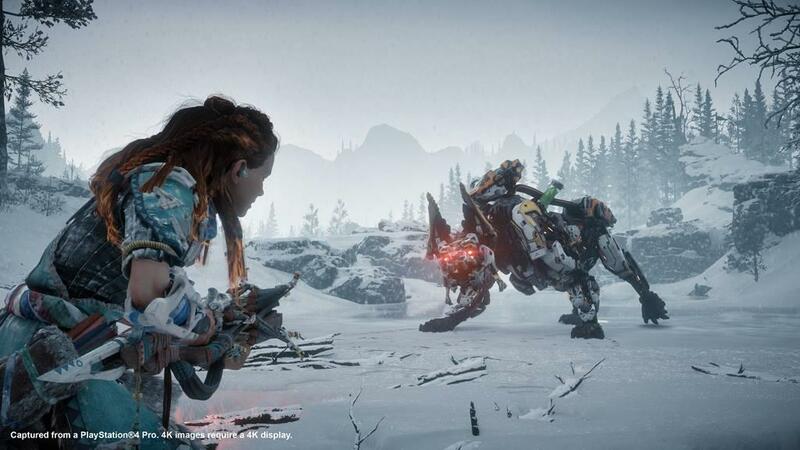 In a world where season passes and loot boxes have become the norm, it’s nice to have a simple expansion pack, with a hefty dose of content, and an interesting side story, and that’s exactly what Guerrilla Games has delivered. 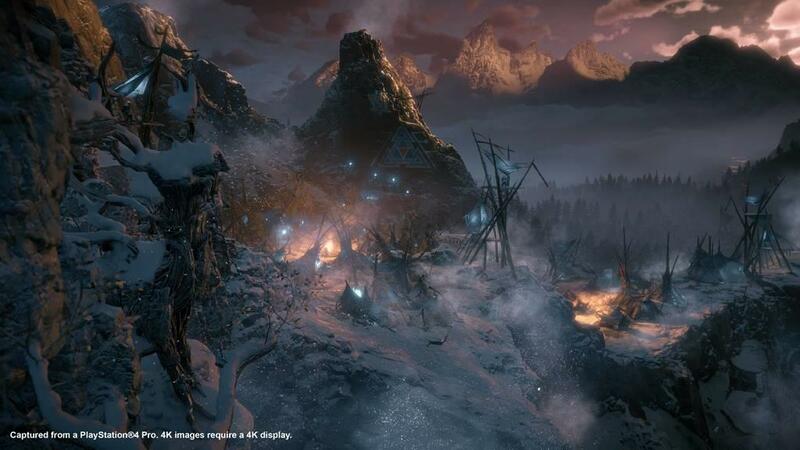 The Frozen Wilds takes place up in an area called The Cut, attached on the north-eastern point of the map. After finding the right NPCs to tell me about it, I was able to make out for an expedition into the great white north. 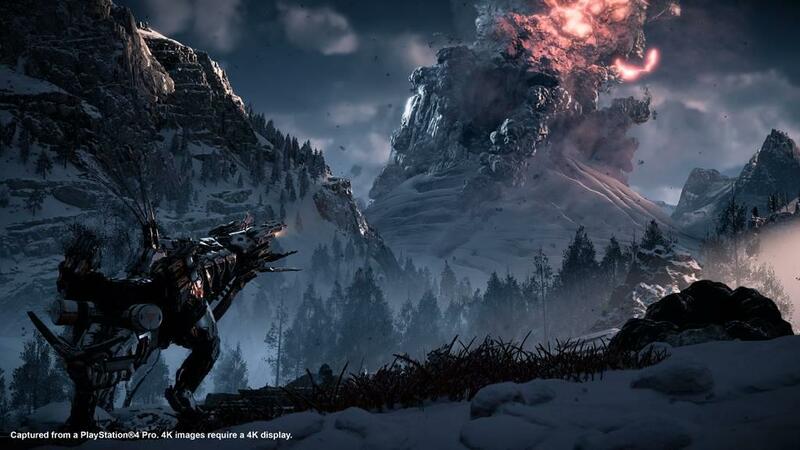 The Cut sounds like a ruthless place, and in practice, it’s pretty brutal, with heavy snowstorms, new enemies, and machines more ruthless than their lowland counterparts, it’s easy to get overwhelmed in combat in The Frozen Wilds. There are new weapons and outfits that actually help take down some of these enemies, so make sure you’re using the new blue-gleam currency that you can find out in the wild and receive as quest rewards. 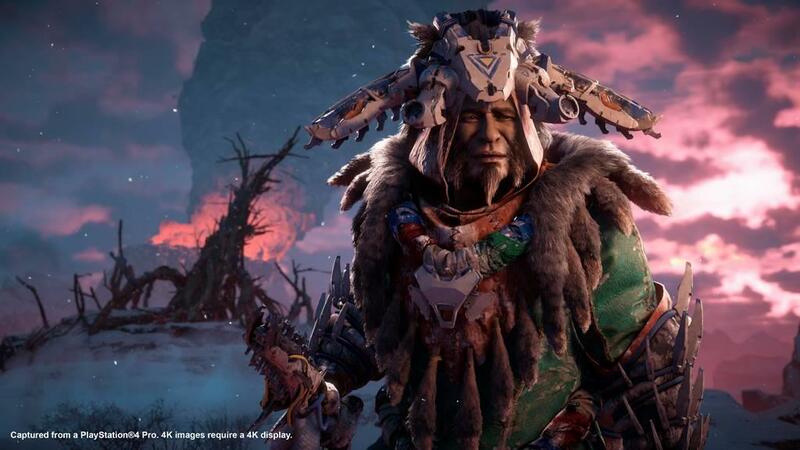 Speaking of quests, there’s plenty to do in The Frozen Wilds. With about a good fifteen hours of content in the form of a story campaign, side missions with some interesting Banuk characters, like the girl who bangs on sewage pipes to make music, but needs a water treatment facility fixed to lower the water levels, which turns into saving a very talkative Oseram who is trapped in said facility. The side quests are well thought out and feel like a good distraction from the main story, which gets quite heavy at times, but comes with some interesting revelations. 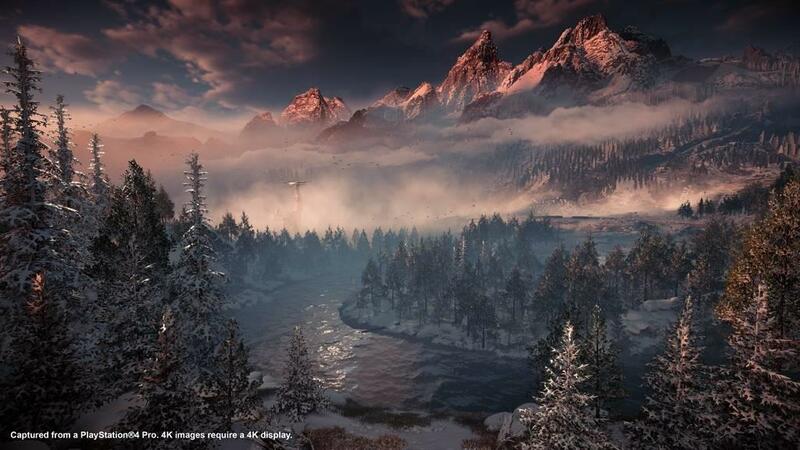 It’s pretty obvious by the end of this expansion pack that they could easily set up for a sequel, or another expansion, but with The Frozen Wilds, the world just grew by an order of magnitudes, especially if you have completed the base game. The difficulty of this expansion pack caught me a bit off guard. Intended for players who are level 30 and up, I found I had a hard time keeping up with some of the enemies at level 45, and the final boss fight had me running low on health potions and healing items, with maybe one gatherable item left to spare after all was said and done. Enemies you come across can also be regenerated now by control towers that you’ll find dotting the landscape. 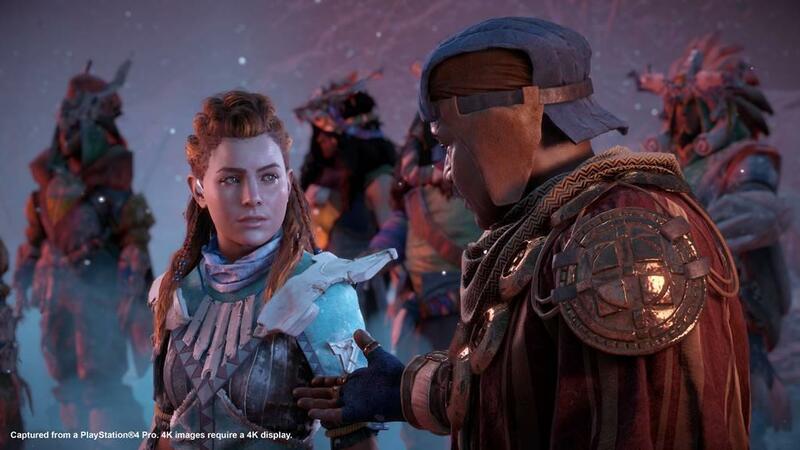 It’s smart to make them a priority, and you’ll find that there are a lot more people willing to fight beside Aloy, so they make for a good distraction. When I say that you should get some new gear, I truly mean, take the time to invest in something new, especially the new Banuk specific weapons, and armor. There is also a character that can improve them, provided you bring her the necessary parts. There’s also a new set of collectibles for you to find in the form of more Banuk animal statues, and paint pigments for a Banuk artist. 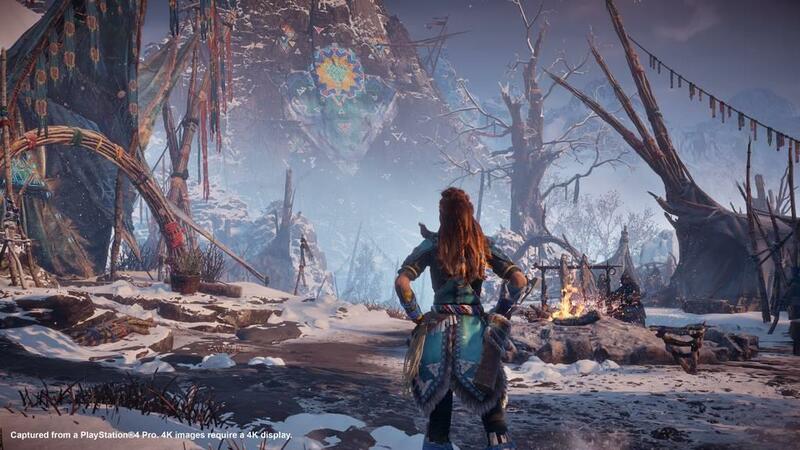 Aloy’s new skill tree is probably the only disappointing thing about this expansion. It doesn’t give her any particularly useful skills. You can now repair mounts, harvest items while riding, and can repair machines that are fighting for you, but out of all of them, I was more keyed in to getting the skill that increased my carrying capacity by 20 percent. I’m a terrible hoarder when it comes to materials in this game, because I constantly find myself running out of ammo in the middle of fights, which in turn causes me to use materials very liberally. 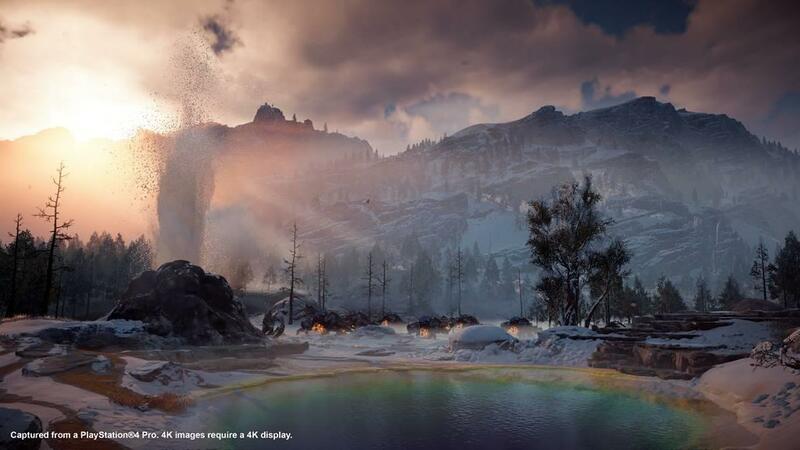 One thing that’s pretty noticeable in The Frozen Wilds is how good everything looks. For a place that is so heavily capped with snow, the development team didn’t skimp on the details. 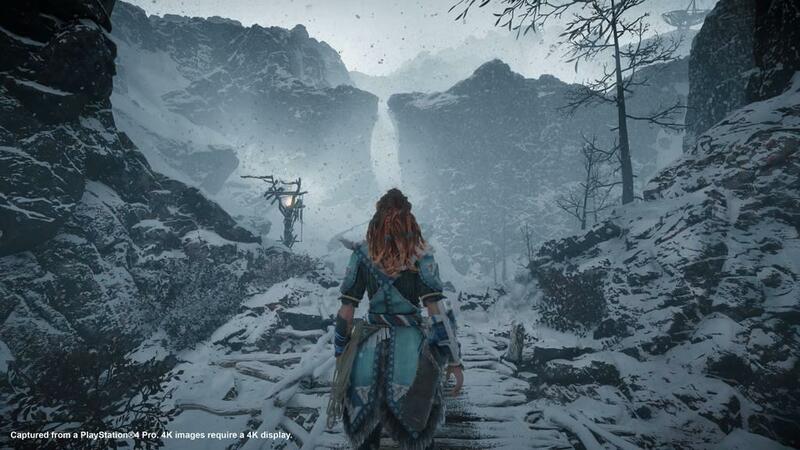 One thing I noticed in particular was Aloy’s gait as she wades through heavy snow, I’m not sure if this was in the base game or not, but it’s a little detail that caught my eye. The other thing I noticed is that characters look a lot more believable in their acting and movements. In the base game there was a little too much uncanny valley, and some of that was caused by how stiff some of the characters were. 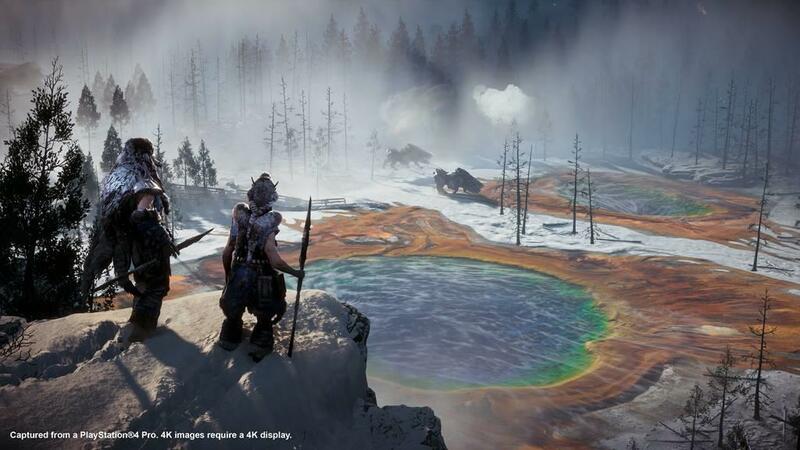 In The Frozen Wilds, characters are animated, vocal, and colorful, and convey emotion a hell of a lot better than the base game. 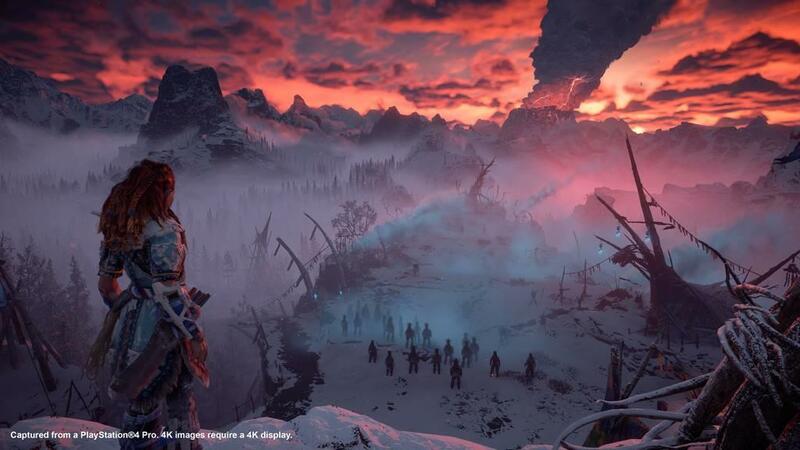 All in all, I’m really happy with how The Frozen Wilds turned out. 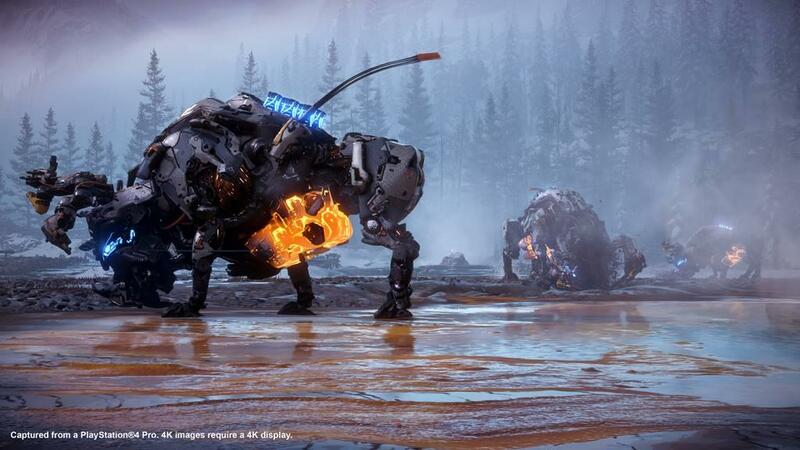 Considering how good the base game is though, I’d think Guerrilla Games would have to go out of their way to make a bad expansion pack. But what’s here is a perfect amount of content, with some post-story boss fights to boot, and enough new ideas to keep players on their toes. 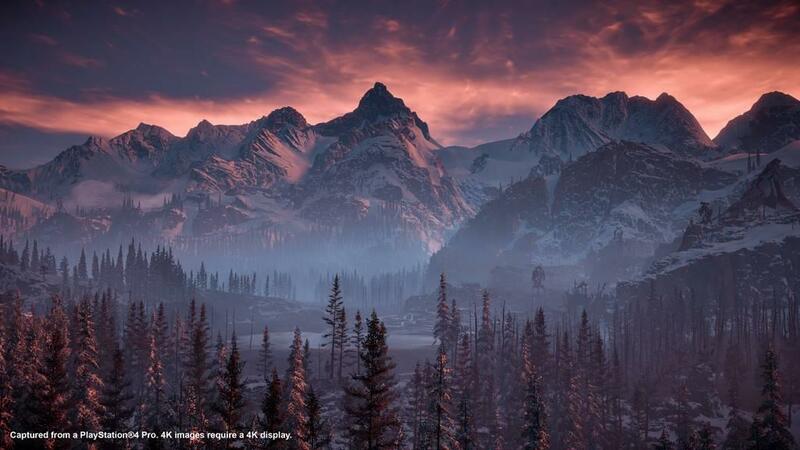 If there’s a shining ray of hope in this loot box crazed industry right now, it’s stuff like The Frozen Wilds.